Hi everyone! I hope I’m following up with you after you’ve had a chance to read last week’s blog post and you’ve all made my healthy Greek Walnut Spice Muffins! We enjoyed them for breakfast all week long and I packed them in my bag for a healthy pick me up in between seeing clients and meetings. At the end of the post I mentioned that I wanted to follow-up with you all here about “healthy fats” and if you made my muffins then you know that I packed a lot of healthy fats (think: olive oil and walnuts) into one easy little recipe. 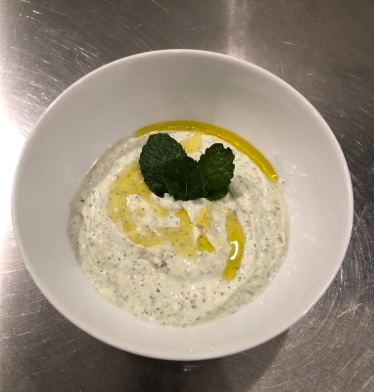 Today, I want to talk about my absolute favorite “healthy fat” ingredient for cooking, baking and preparing dressings and sauces. Olive Oil. 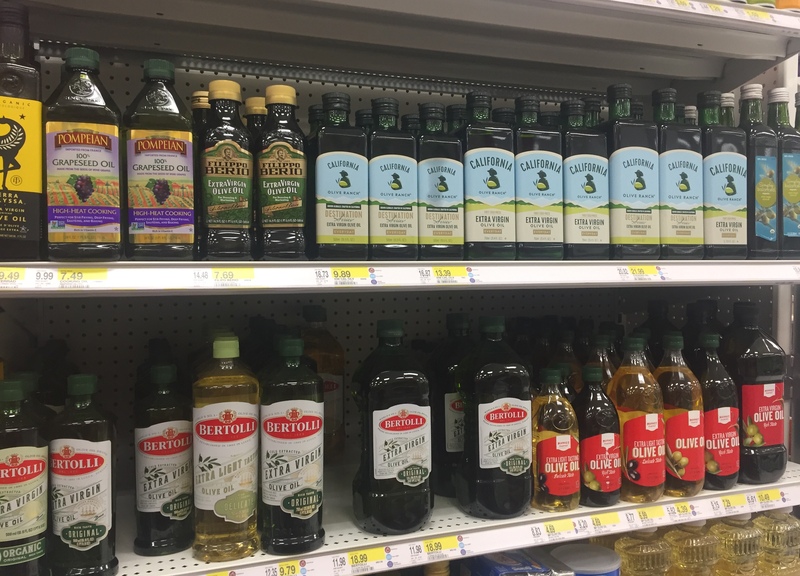 The importance of writing about this topic became apparent to me after I had several clients and friends come to me asking, “What oil should I be cooking with?” “There are so many options.” They are right. Today, there seems to be an overwhelming amount of choices when it comes to choosing what type of oil to cook, sauté, bake and roast with. There’s coconut oil, walnut oil, almond oil, vegetable oil, avocado oil, olive oil….the list goes on and on. My personal favorite (and one that other nutritionist and cooks alike tend to agree with) is olive oil. Specifically, and this is very important, extra virgin olive oil or EVOO. An olive oil that is labeled “extra virgin simply means that the oil is not refined and not overly processed and therefore is of high quality. The reason why I will always choose olive oil stems greatly from scientifically backed research supporting the health benefits it provides. Although I do also choose it because I LOVE the rich, buttery, nutty flavor that olive oil adds to everything I make with it. An essential component of the Mediterranean diet (remember when we talked about that here? ), EVOO is the healthiest oil choice because of its numerous health benefits. It is rich in healthy monounsaturated fats, (The American Heart Association and FDA recognizes olive oil as a heart healthy fat due to its high content of monounsaturated fat and recommends consuming 2 tablespoons of olive oil daily in place of other saturated fats), it contains vitamins E and K, and is loaded with powerful antioxidants. These crucial antioxidants are known to fight inflammation and are great for your cholesterol—the good (HDL) and the bad (LDL). EVOO has also shown to therefore lower blood pressure, and reduce the risk of heart disease. Delicious and nutritious, a win, win situation in my book. In several conversations with my clients I noticed that the same question arose over and over again in reference to cooking with olive oil. There seems to be a misconception that olive oil develops dangerous toxic compounds when you use it with high heat and that it even loses its nutritional value when heated. Not only is there no evidence that has ever supported this misconception, Dr. Simon Poole, author of The Olive Oil Diet, states that, “EVOO produces the lowest level of potentially harmful by-products, like polar compounds and trans fats, that are created when a cooking oil is heated. EVOO is actually quite stable and resists breaking down when heated. 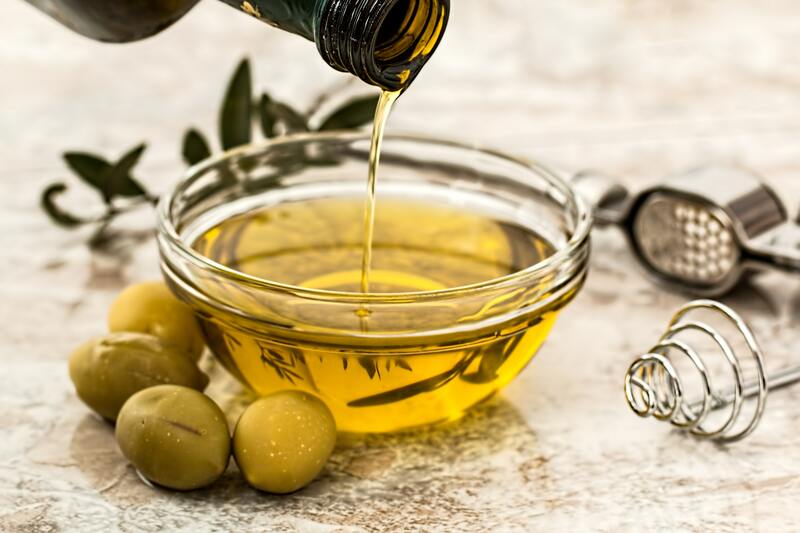 This stability comes from a variety of factors, including being naturally rich in monounsaturated fat and antioxidants as a virgin cooking oil (i.e., virgin oil is not refined).” https://www.aboutoliveoil.org/cook-with-extra-virgin-olive-oil. The bottom line is it to not fear cooking with EVOO as it actually has demonstrated to be the most stable oil of them all when heated. Lastly, you might notice LOTS of options at the grocery store the next time you go to purchase your EVOO. It can be overwhelming. So, for tips on how to purchase the right olive oil, I turned to the experts at The North American Olive Oil Association. They conducted the nation’s largest olive oil testing program and have concluded that consumers can follow some very simple advice for picking the perfect, inexpensive EVOO: https://www.aboutoliveoil.org/5-expert-tips-for-buying-olive-oil. Know your olive oil grades. Olive oil is labeled as Extra Virgin, Virgin, or Olive Oil (sometimes “Classic” “Pure” or “Light-Tasting”). All olive oils have the same number of calories and all have heart-healthy benefits. Extra virgin or virgin olive oils offer additional health benefits because they retain an abundance of vitamins and polyphenols that have antioxidant, anti-inflammatory and antimicrobial properties. Look for a best-by date. The best-by date should be as far out as possible, though with proper handling olive oil can keep in a sealed container for about two years. Purchase bottles sizes that you will use within a few months of opening. Olive oil degrades when exposed to heat, oxygen and light on the shelf. The volatile flavor compounds in extra virgin olive oil will dissipate if stored improperly or for too long. Use the oil within a reasonable time of opening for best results. Note the country of origin. This is required by federal labeling laws and is typically found on the back label near the nutritional information and ingredient statement. Oils from different countries are often blended in order to produce a consistent and/or specific flavor profile, so don’t be alarmed if more than one country is listed here. Look for quality assurance seals. The bottle may carry an origin seal that indicates the region of origin, USDA Quality Monitored Seal, or the NAOOA Quality Seal. The NAOOA Quality Seal is a guarantee of authenticity and quality that is backed up with sensory testing AND off-the-shelf laboratory testing at least twice a year. Now that we’ve discussed the health benefits that come with consuming EVOO, we’ve debunked the rumors that cooking with EVOO is dangerous and we’ve outlined the best tips for purchasing olive oil, are you sold yet? I use olive oil throughout my entire day. You can find it in my cooking and baking, in my salad dressings and sauces and even in my soups. I’ll leave you today with one of my favorite recipes. It’s star ingredient is EVOO! It’s healthy, delicious and so versatile. Sometimes I serve it on it’s own as a dip and last night I ate it with my grilled salmon. I hope you all make this ASAP, you won’t be disappointed. Pepper and salt to taste – I don’t add salt because I am salt sensitive but you can add a little as needed! In a small food processor (or blender) add all ingredients. Blend until smooth. Mix well – use as a dip, dressing or put on your roasted veggie, grilled chicken or fish, I love this most when added to a large mixed salad! Store in fridge for up to a week!